Bars and restaurants often incorporate open kitchens as well as hard, sound-reverberating surfaces such as glass, timber, polished concrete floors and hard seating. These trends have resulted in increased noise and disruption to patrons and more importantly to staff, often to the detriment of their health and wellbeing. These interior design trends are now driving the demand for sound absorptive and to a lesser degree sound diffusive materials. The Lombard or cocktail effect is a natural response in humans to raise their voices in a reverberant noisy space. Everyone in the space is compelled to talk loudly to compete to be heard, resulting in a cacophony of uncontrolled noise. All of the above makes for a perfect storm of reverberated noise and reduced enjoyment for patrons and staff, who are increasingly subjected to unnatural levels of noise for up to 8 or 12 hours a day. Due to this complexity in room acoustic design, Instyle highly recommends engaging an acoustic consultant at the earliest stage of the design process. 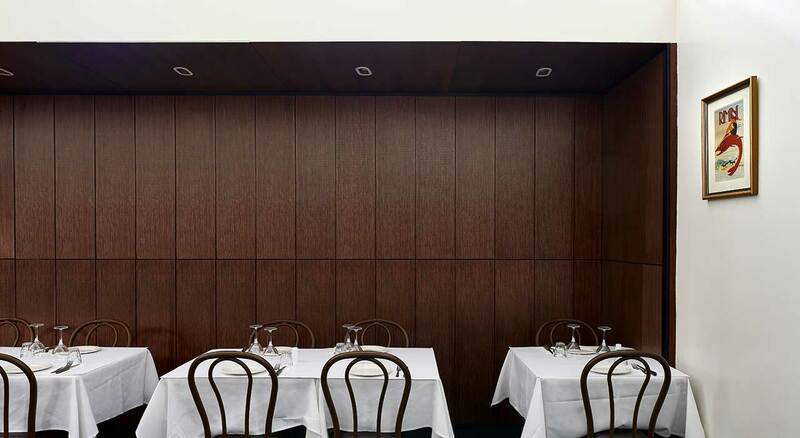 Ecoustic® Veneer provided an elegant and effective acoustic solution in this busy restaurant that previously experienced excessive noise levels, a common issue that exists in many restaurants today.